Mahebourg is located on the south-east coast of Mauritius. Part of the Grand Port area, it is the main village in the entire district. Historically, Mahebourg was a port town, however during the French colonial era, Port Louis was chosen as the main port and Mahebourg changed into a coastal town. Visitors can gaze upon the past of Mahebourg at the Historical Naval Museum, which showcases the naval battles of yesteryear between the French Navy and the Royal Navy. Mauritius has a tropical climate, with moderately high temperatures and humidity all year round. But, temperatures (although reaching the mid-30s) never become unbearable. The wet season lasts from January through to March and during this time, cyclones may pass through the islands bringing heavy rain and wind. May to November are much drier months and temperatures remain in the the mid to high 20s. Be sure to check out the National History Museum while in Mahebourg to see early maps of Mauritius, the bones of extinct species such as the dodo, and the naval history and most recent addition of Napoleon's boat. The Monday Market is a must-see. While it’s open every day of the week, it doubles in size on Mondays. You can see stalls set up near the waterfront full of fabrics, fresh produce and food stalls. The Rault Biscuit Factory tour is another must-do once. The 20-minute tour shows how the delicious biscuits are made and how little the process has changed since they first began in 1870. Blue Bay and its lagoon are home to the largest coral reef on the island. It is home to 50 different types of coral and many different species of tropical fish. The beach is generally quiet during the week, making it idyllic for relaxing. Snorkelling tours are available at Blue Bay, but tourists are asked to be respectful of the coral reefs as they are easily damaged. Pointe D’esny beach is one of the best-kept secrets of Mauritius. The beach has soft white sand and crystal-clear waters, but no tourist amenities. La Cambuse beach is one of the least visited beaches in Mauritius despite its sandy shores and clear waters. The beach is beautiful to relax on, but the currents of the sea are strong and not recommended for inexperienced swimmers. While in Mahebourg, visit Notre Dame des Anges, the church that dominates the skyline. Although locals still worship here, it is open to visitors.The Mahebourg Mosque is also one of the most important landmarks in Mahebourg.The main street in Mahebourg is home to many Hindu temples, too. When visiting places of worship, visitors are asked to be respectful of the religion. Mahebourg is home to many restaurants serving fresh and traditional food. One of the best places for biryani or kebabs in Mahebourg is Pyramide, found over the road from the markets; it’s popular with locals and visitors alike. La Vielle Rouge is a fresh fish and seafood restaurant with an outdoor garden area for you to enjoy your home-cooked calamari. If you’re looking for something more local, the markets and main streets are home to street food vendors cooking you traditional Mauritian food right in front of your eyes. Most bars in Mauritius are open every night, but head to Grand Baie if you’re looking for more nightclubs and discos. Mahebourg is also home to the Banco Casino if you’re willing to try your luck at the tables. As well as snorkelling tours, the beach at Blue Bay is perfect for kitesurfing and windsurfing. There are many local places to rent cars from in Mahebourg, and most accommodations are willing to help you get one. 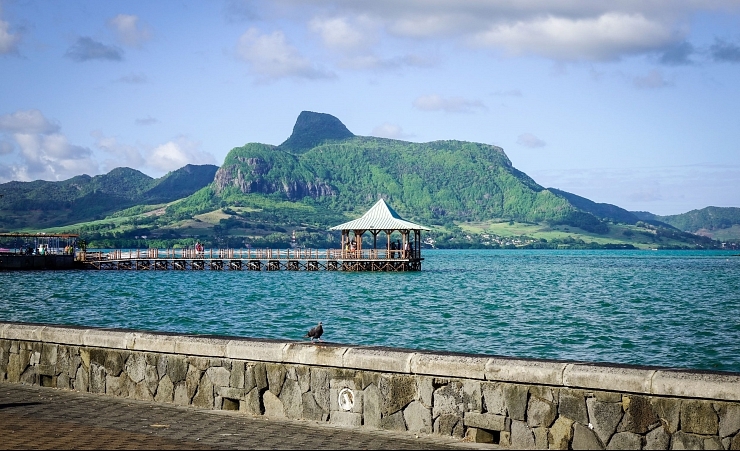 Alternatively, taxis are also available, and there are buses and shuttles to other areas of Mauritius.